Animal therapy transforms disabilities into abilities. Located in Mount Holly, New Jersey, Beyond Balance is not your typical horseback riding facility. 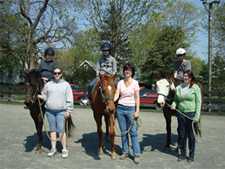 The nonprofit organization aims to provide therapeutic riding experiences for individuals with special needs in a caring, family-oriented environment. Beyond Balance offers mounted activities to teach participants how to ride a horse, which improves their flexibility, balance and strength. The organization also provides ground lessons to promote horsemanship skills and animal bonding, as well as community outreach in order to educate others about the benefits of therapeutic riding and equine-assisted activities. Therapeutic riding has been proven helpful to individuals with special needs in a variety of ways, allowing participants to reap positive changes in many areas of their lives. Some of the physical, psychological, educational and social benefits include improved self-confidence, better eye-hand coordination and increased social interaction with the horses, therapists, instructors, volunteers and other students. There are many ways to help Beyond Balance flourish, including volunteering, which provides a means to learn about horses while making a difference in people’s lives. Volunteers must be at least 14 years old and assist with horse preparation, horse leading and grooming. Monetary donations and horse sponsorships are also needed. Donations are raised through fundraisers and charitable giving programs. Follow Beyond Balance on Facebook at www.facebook.com/beyondbalancetr for frequent updates. Visit www.beyondbalance.org or call (609)969-8899 for more information. Amy Rossi is an animal welfare columnist for the Philadelphia Examiner. She currently resides in Bucks County, Pennsylvania. Join her Facebook fan page at www.facebook.com/phillyanimalwelfareexaminer. A Place to Call Home By Terrence P. Zealand, Ed.D. Providing resources to AIDS-stricken families.